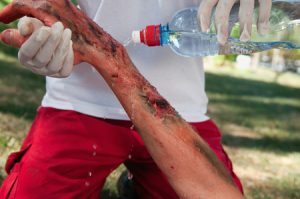 How much compensation can I claim for a burn injury? Unfortunately burns and burn related injuries are more common than you might think and in many cases, they can be very serious resulting in lengthy periods of medical treatment. If your burns happened as a consequence of an accident that was not your fault, then there is a good probability that in fact you might be able to claim compensation for your injuries. As is so often the case accidents such as these can be caused by negligence of carelessness on the part of another person; this might be a local business or perhaps the council and it is worth remembering that somebody should be held to account. Burn injuries can have an effect on you day to day life and if this is the case you should not have to deal with the extra financial expenses that you might incur. Get in touch with us, we can help you to make a claim for the compensation you are entitled to. Our guide should contain all the information you need, but if you have any questions we are here to help. What reasons are there for claiming compensation for a burn? Have you suffered a chemical burn? I have been scalded from a hot drink – could I claim? I have been burnt at work can I claim compensation for my injuries? What can be claimed for within a burn case? How much compensation will I receive for a burn injury? Why choose us for your burn claim? The purpose of this guide is to give guidance to those people who have suffered burns with the details of how to make a personal injury claim, and why a personal injury claim should be made. We will guide you through the process of making a claim, and look at the type of costs that might be included in your claim. There is also a comprehensive table of compensation amounts for burn injuries that will give you some idea of the amount of compensation you might expect to receive in the event of a successful compensation claim. The compensation amounts contained within the table should be used a guide only as circumstances will vary from cases to case, however they can certainly be helpful in allowing you to estimate how much compensation you might be entitled to as a consequence of your burns injuries. Injuries from a burn are more common than you might think. The British Medical Journal (BMJ) estimate that around 175,000 visits to Accident and Emergency each year are due to the receiving of burns, and as many as 10% of that number might need treatment in a specialist unit. Burns can range from the slightly superficial, but still painful, scald to the more serious burns that can result in second or even third-degree burns, which require significant medical intervention. If you have encountered burns, no matter how severe, as a consequence of an accident that was not your fault then you may be able to make a claim for compensation. Your compensation claim will take into account a number of factors such as they severity of the burns you have sustained, circumstances such as loss of function, pain and suffering as well as any emotional and financial upheaval will also be taken into consideration when beginning your claim. Choosing a company who use a No Win No Fee Basis for personal injury compensation claims affords you several advantages, the biggest of which is that whatever your financial circumstances anyone will be able to make a claim for compensation. If your burn injury solicitors are unable to win your burns injury claim, then you will not owe anything. The level of financial security that is afforded you by opting for a No Win No Fee service can be invaluable and offers you the level of support you need to begin your claim. If you choose a solicitor who charges at an hourly rate to work on a compensation claim that you may find yourself worrying about just how much the work they are doing for you will cost you, and what size bill you might receive at the end of your case. There is also the worry that regardless of the outcome of your case you will still need to pay this bill. In some case’s there is also the worry that a solicitor may have taken your case on even when there is little chance of a successful outcome. At Accident Claims if we feel that you do not have a case we will tell you, we do not believe it is anybody’s interest to waste time pursuing a claim that has little chance of a payout. There are a number of different reasons that you might have suffered a burn and we can put you in touch with a team of specialist burn injury lawyers who have many years of experience when it comes to handling claims for compensation that relate to burns whatever the cause. Road accident – If you have been involved in a road accident and have sustained burns from that accident than you may be able to claim compensation for those injuries. Burns as a consequence of a road accident can occur if the accident causes a fire, vehicle fires can be particularly dangerous and often the burns that occur as results of a road accident can be severe, causing not only significant pain but also lengthy medical treatment. Accident at work – Accidents at work can happen, even when the best safety measures have been put in place. Depending on the type of job you hold and your place of work the severity of the burns you sustain will probably vary from the more minor scalds to a much more serious burn, especially if you work with chemicals or flammables. Severe burns can cause serious issues that might mean taking a long time off work to recover, significant amounts of medical follow up and even struggling on a day to day basis with simple tasks. Medical negligence – There is a possibility for burns to occur in a medical environment, whether as a consequence of radiation treatment, laser treatments or even chemical burns where there is a possibility for a patient to be in contact with substances that might be hazardous. In some cases these types of burns can be due to negligence on the part of the medical staff, however, in other instances, this can occur in a situation which could not have been avoided. When burns are the result of medical dressing, especially some forms of adhesive plaster, this may be down to medical negligence. However, if the patient and the person treating them were not aware of the patient’s allergy to the plaster then there is unlikely to be a claim for compensation to pursue. Hot food and beverages – If you are served a product, either in a fast food outlet, restaurant or other eating establishment that is far too hot to be safely consumed then you are at risk of being scalded or burnt. If you have been scalded or burnt by hot food or beverages from a takeaway or restaurant then you may have a case for compensation. If you have suffered a burn from an injury that is not listed here then you may also be able to pursue a claim for compensation. Please get in touch with us to discuss the details of your case, we will be happy to help you. Get medical attention – The most pressing thing to do in the case of a burns injury is to seek immediate medical attention, burns can be more serious than you first realise so it is important to be assessed by a doctor. Make sure that the appropriate course of treatment for your burns is started as quickly as possible. The medical professional you see will be able to make notes on your injuries which can then be used to produce a report to help your compensation claim. This can be important in the case of working out the amount you can claim. Collect witness contact information – If there were any witnesses to your accident it is a good idea to try and get contact details, this will really help to support your compensation claim should witness statements be required. Make a record of the events that happened – It is important to give yourself time to begin the healing process but as soon as you are able to it is important to make a note of the events that happened in the run up to your accident. Make sure that you write down as many of the details as you can. If you are unable to do this due to your injuries, then ask someone else to write the details down for you. Keep paperwork relating to expenses – You might be able to make a claim for any of the costs that you come in for as a direct result of your injuries, these are known as special damages. Keep any receipts and paperwork that you are given as you will probably need these in order to provide proof of the expenses that you have had to meet. If you have suffered a burn as part of an accident that wasn’t your fault you may want to pursue burn injury compensation claims. We are aware that making a claim might be the last thing on your mind in the immediate aftermath of your accident, however making a claim can help you to come to terms with the injuries you have suffered and help you financially if you have incurred extra expenses as a consequence of your injuries. Beginning a burns injury compensation claim is not a complicated process. We can put you in touch with one of our team of qualified solicitors who have years of experience dealing with claims just like yours, they will be able to help you pursue your claim and achieve the maximum compensation amount for your injuries. We can begin the claims process with a free no obligation consultation during which we will take some details about your case. This will allow us to assess your case properly before proceeding. Once you are happy to proceed with a claim we will do everything we can to secure a compensation payout for your claim. Chemical burns can be very serious, if you have been in an accident that has resulted in a chemical burn then you should seek immediate medical attention. If the accident was not your fault but a consequence of some negligence of someone other than yourself, then you may be able to make a claim for burns injury compensation. When you are ready to pursue your claim, contact us and we will go be happy to discuss the details of your injury and your possible claim with you. I have been scalded by a hot drink can I claim? If you have received a burn injury from a hot beverage that was too hot to consume, whether the drink was purchased in a restaurant, on a train, to take away or from any other establishment selling hot drinks then you may be able to claim compensation for your injuries. If you are uncertain if you have a claim, then get in touch with us and one of our experienced members of staff will be happy to look into the details of your case with you. If you have been injured in a workplace accident that has resulted in a burns injury, then you might be able to make a claim for compensation and we can assist you with this. Every employer has a duty of care to their employees to make sure that the workplace is safe and healthy places to work. If they have been negligent in failing to put the appropriate health and safety measures in place, then you may be at liberty to pursue a claim for compensation. As part of the duty of care an employer should carry out risk assessments on a regular basis, there are a number of reasons that a burns injury might occur in the workplace, if your injury was sustained as a result of an accident that was caused by someone else’s negligence then get in touch with us to discuss beginning a claim for compensation. An example of skin burn at work claims payouts can be found by using our compensation calculator, but it is important to remember that this figure is a rough guide only as payouts will vary from case to case. What you can claim for, and the burn claim amounts you can seek will vary from case to case as no two cases are ever the same. When it comes to making a claim for compensation for a burns injury there are a number of factors that will have a significant impact on the amount of compensation that can be claimed. Burns are unpredictable, and will vary depending on the type of burn sustained and the way in which a person recovers. Future earnings – Depending on how long your recovery takes, and therefore the length of time you are unable to work for you might be able to claim for the loss of future earnings as well. If you have obtained severe injuries that affect your ability to do the job you did before your accident, then this might be covered as well. Special damages – These are damages that cover the personal circumstances of a victim, helping them to get back on their feet financially following their injury. Travel expenses – If your burn injury has affected your ability to drive then you may need to use other forms of transport to attend appointments etc. You should be entitled to make a claim to cover these expenses. Medical Expenses – If you’ve incurred medical expenses for treatment you have received for your burns injuries for example medication or hospital bills then you may be able to claim for these as part of your personal injury compensation case. Our burn compensation calculator will give you an indication of the amount of compensation you might expect to receive for a compensation claim for your burns injury. We understand that many claimants might want to get an idea of the sort of amount of compensation they could expect to receive for their claim, however it is important to remember that neither our company, nor any other one will be able to give an exact figure for burn injury claims. Any figures that you find online should be used as a guide only as claim amounts will take into consideration a number of different factors such as injury severity, 2nd degree burn settlements, for example, are likely to be higher than those for 1st degree burns, and these will vary from one case to another. What we are able to do is provide you with some figures that will give you an indication of the average compensation for burns payouts that are awarded. Our table below, which should be used for illustration purposes only, shows figures for the amounts that are typical for those burn injuries that are most common. There is a possibility that the injury you have sustained is not included in the table, if this is the case please get in touch with us and we will be happy to discuss the possible estimated figures that you might expect to receive for your claim. Visible Scars caused £5,700 to £16,550 Leg, back or arm scars that are noticeable. When it comes to personal injury compensation cases we are a leading law firm with many years of experience within the industry, rest assured that we will handle your compensation claim with all the professionalism that it deserves. Over the years we have been involved in successfully securing compensation payments for hundreds of satisfied clients. We handle each case that we undertake with the same care and attention, we believe that the compensation process, whilst it can be stressful, should be as simple as possible for all of our clients. We offer the best service that we can and believe in treating all or our customers with compassion and respect that they deserve having suffered injuries due to the negligence of others. If you have suffered a burns injury, as a result of a road accident or any other form of accident and you would like to make a claim for compensation then please get in contact with us. We will be able to commence the claims process for you. Our team of dedicated professional staff can be contacted on 0800 073 8801. If you have any concerns regarding the claims process, we will be happy to discuss them with you. We want to make sure that you understand the claims process. Our primary goal is to help you achieve the maximum burns compensation payouts that you could be entitled to. This useful link to the NHS website offers information on the treatment of burns and scalds and what types of treatment you might expect to receive for a number of different types of burns. This NHS website link contains information that specifically relates to burns caused by acid and chemicals. It is important to remember that these types of burns require immediate attention. This final link contains information from the Health and Safety Executive about burns and scalds in the health and social care sector.